This entry was posted in Nick Love and tagged Buffalo Bill, Native American, Popular Entertainment, Show Business, William F. Cody by Nicholas Love. Bookmark the permalink. Thanks for this thoughtful post, and for sharing this interesting primary source. Buffalo Bill is a fascinating figure, and you’re right to point out that despite his high-minded talk, his actions showed his true feelings towards the Native Americans he exploited. (Then again, we could argue that he at least employed Native Americans in his show, paid them real wages, brought them with him on international tours, while his at the same time his peers continued to kill and segregate Native Americans…). 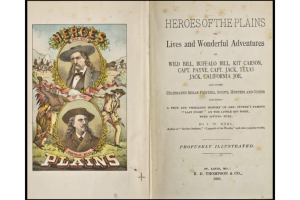 I’d caution you not to give Buffalo Bill agency he doesn’t deserve, specifically in crediting him with the depiction on the cover of this book. Cody isn’t doing any portraying here: he’s being portrayed by the author, Buel, or whoever designed this cover page. And while you may be right about Cody as a “sell-out,” I’m not sure this book proves your point. Drawing in one more primary source, or summarizing a secondary source (surely there are biographies of Cody) would help in this regard. All in all, though, this is a fine first post, and I look forward to reading your next one!